Proud about the PROUD Travel Guide that is a report and discovery tour in one. It compiles the ideas and stories of many. The PROUD partners brought together their experiences of the PROUD Europe project 2010 – 2105. At the same time it is an exploration in the world of co-design by many PROUD friends – people and organisations that we got connected with on our way. These friends have chosen for a co-design approach while working on topics varying from creating new jobs for young people to making a change in the Dutch food system, from place-making after hurricane Sandy in New York to sparking electricity in Rural India. The book also contains practical tips and references to toolkits. 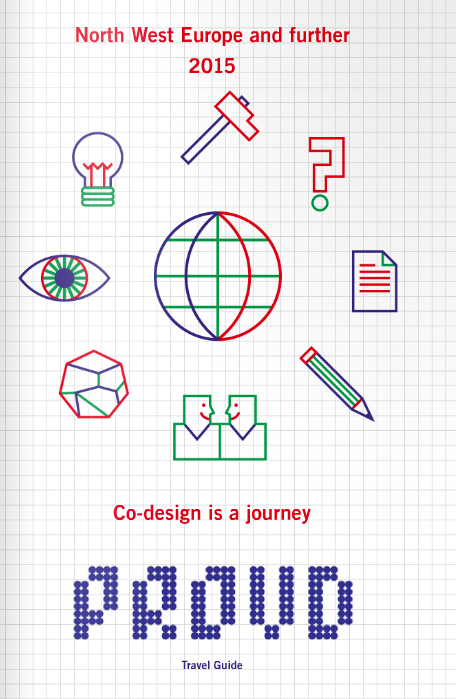 So if you’re into co-design join the journey! The pdf version is available at ISSUU.